In game two of today’s series between Splyce and Roccat, top lane player Martin “Wunder” Hansen chose to counter Roccat’s Shen pick with the mad alchemist Singed. The results? Fairly impressive. Hansen was in prime form in game two of the series, looking comfortable on the pocket pick of Singed. In the clip above, you can even see him dancing in the middle lane, taunting the Roccat squad that can’t touch him. After a few early Dark Seals, an item which gives the holder bonus healing from potions, Hansen went for a full rush-down build. Boots of Swiftness, Righteous Glory and his ultimate (which significantly boosts almost all of Singed’s stats) meant he could run in and out of fights with reckless abandon. 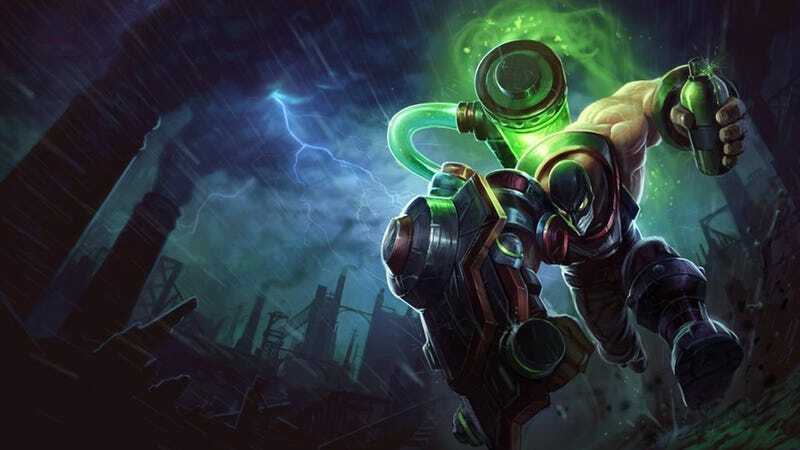 Using Singed’s poisonous chemical trail, he was able to zone out players and flip out-of-position champions over his shoulder, into the waiting arms of his team. With the damage output coming from Jonas “Trashy” Anderson’s Kha’Zix and Chres “Sencux” Laursen’s Corki, Splyce made quick work of Roccat and closed the series out at 2-0. The win helped solidify Splyce’s spot at third in group B of the European League Championship Series’ Spring Split, where the team now rests 3 wins above its closest competitor in Team Vitality. If Splyce holds that spot, it could mean a solid playoff berth later this season.